On Wednesday, July 4, 2018, Macon-Bibb County will host the 24th Sparks Over the Park Independence Day Celebration at Lake Tobesofkee. 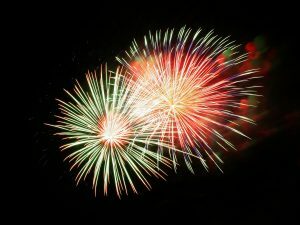 All of the parks at Lake Tobesofkee will be open, there will be a live band, and the day will conclude with a fireworks show. During the day, there will be normal activities such as swimming, boating, sunbathing, picnics, disc golf, volleyball, and more. Gates will open at the parks at 7:00 a.m., and Sandy Beach Water Park is scheduled to be open from 10:00 a.m. – 6:00 p.m. The Loose Skrews will be performing from 6:00 – 9:00 p.m. at Sandy Beach Park pavilion, and the fireworks show will start about 9:15 p.m. Gates will close for anyone wanting to enter the parks at 8:00 p.m. Admission to the parks is $5.00 for every car or motorcycle, $15.00 for every passenger van, and $30.00 for any vehicle that can accommodate 30 or more people. No alcohol or glass containers are allowed in the parks. According to Tobesofkee Director Donald Bracewell, several thousand people are expected to be on the lake and beaches throughout the holiday, and he recommends following all safety rules and tips, and to follow instructions by Rangers and the Bibb County Sheriff’s Office. Rangers, the Department of Natural Resources, and other emergency personnel will be on the water and in the parks to assist with any problems that may arise. Anyone interested in boating laws can pick up a boating safety handbook at the Lake Tobesofkee office or any DNR office. People can also go on line to www.goboatgeorgia.com for more information. A new boating law went effect July 1, 2014, that requires anyone born on or after January 1, 1998 must take a boating safety class approved by DNR in order to operate a personal water craft or boat, as well as other restrictions. All persons on a boat must have a PFD that is Coast Guard approved, in good condition, fits the person that intends to wear it, and is accessible at all time. Kid under 13 must wear PFD’s (personal flotation device) at all time on board a moving vessel. Any person 16 or over who operates a boat on Georgia waters must have a picture ID on board. All boats must be registered and have registration on board. Operators must obey the rules of the road and be familiar with all boating laws.